the season of new beginnings and fresh growth is upon us! 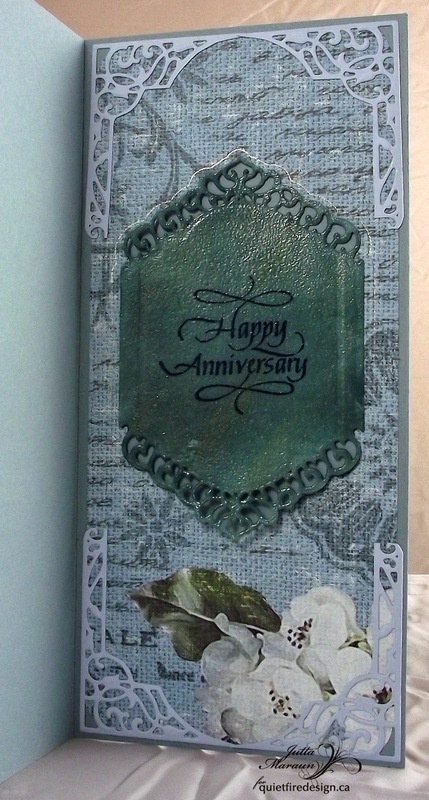 For this card I used a LT blue premade base and punched the flowers on RH corner. Crisp Cantaloupe to add the ribbon effect, also stamp envelope flap at this time. Stamp the Chickadee with Burnt Sugar and the Sing...sentiment in Tempting Turquoise. Used markers to colour Chickadee and add twine to complete. -The Woods Would be Very Silent stamp set. -Ink and Markers-Crisp Cantaloupe, Burnt Sugar, Tempting Turquoise. for April Swap at Let's Swap ATC's Flickr Group. Thanks for the visit, enjoy the rest of your day! 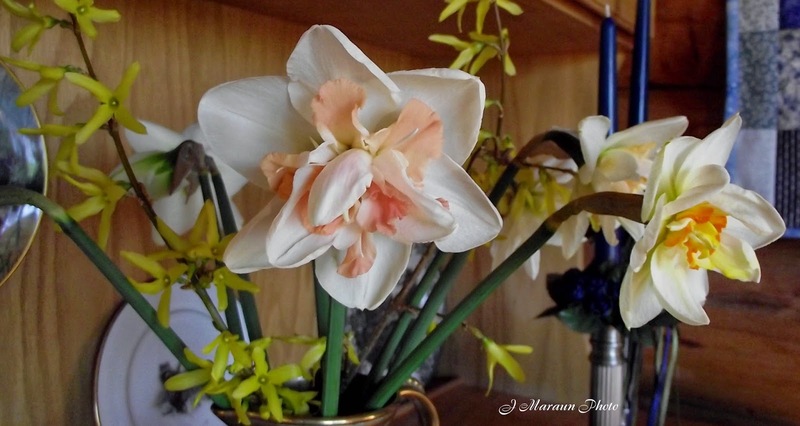 My Easter bouquets this year included a few different types of Daffodils. These came from a roadside stand a few kilometers down the road. We only have the standard ones growing in the yard. It's funny how the camera interprets things differently than our eyes . I appreciate your visit and wish you all a Happy Easter! 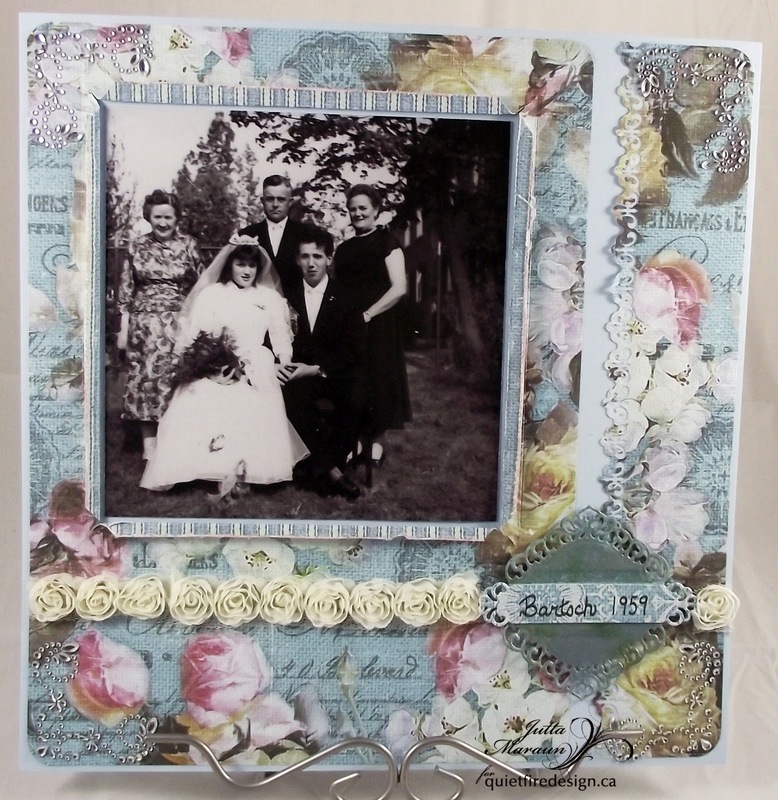 here are photo's of my two projects, a 55th anniversary card and scrap book page. For instruction and materials list please visit me at Quietfire Creations blog. Here is my collage of all the projects that I made in March. Thanks for stopping by today, enjoy your weekend! I'm back and this time with a Thank You Card! get started with my Silhouette Cameo. The Tulip Digi-stamp is from Bugaboo. from Silhouette's Online Store and the Cameo's Print and Cut feature. through Silhouette Online Store . Hello! Hope you had a nice weekend! a wonderful quote stamp from Quietfire Design. The stamped butterfly is from Stampin Up! and the punch is MS.
April Vintage Collage Group Exchange. Sometimes the stamp does all the work! Thanks for looking, have a wonderfully crafty day! 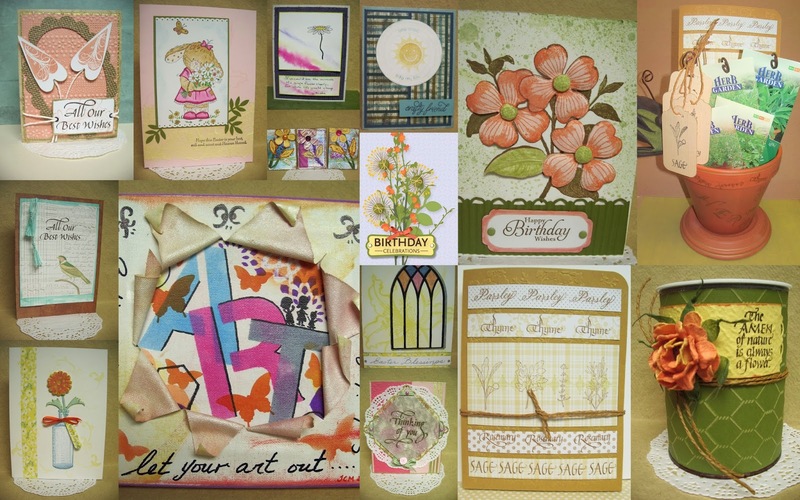 Labels: Cards, Jutta Maraun, Stampin Up! quote stamp from Quietfire Design. Cut a 8-1/2" x 6-1/2" pc of Core'dinations cardstock and fold in half for base, set aside. Stamp Quietfire Design Quote on 4"x 6" pc of CS Superstock in Jet Black AI, heat emboss with Clear EP and heat tool. Swipe Distress Ink pads directly on CS Superstock, start with Squeezed lemonade in center, then Wild honey over and to the right and same with Tumbled glass on left. Allow to dry, using the 2nd largest SB Large Deckles Rectangle Die as a stencil hold on angle to quote, with Blue jeans DI ink all around die using a dauber. Leave Die in place and allow ink to dry. Trace around die with Clear Glitter pen. Move Die to angle opposing way and again trace around this time using Black Glitter pen. Using Perfect pearls and a paint brush, paint swirls over only the blue areas outside of the Die tracings. To complete run Faded jeans DI around the edge of panel, adhere to base and add Star stickers. Now I'm off to make a collage to enter into Anna's Art Creative March. So long for now, thanks for stopping by! I'm unveiling a brand new stamp set. Here's a sneak peek only! awesome new Quietfire Design Stamp Set - Parsley, Sage, Rosemary and Thyme. a great way to welcome spring into our crafting! 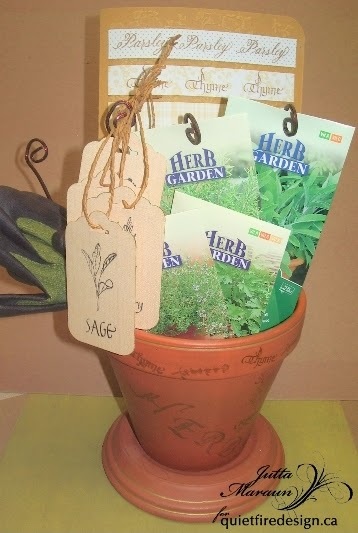 when combined make this lovely Herb Garden Gift Set. a chance to win the If I had a Star Stamp.